Is it acceptable to serve food in shoes, dog bowls, or plant pots? August 22, 2017, 11:46 a.m.
Back in 2014, MasterChef judge William Sitwell described square plates as “an abomination”. The battle over acceptable eating vessels has moved a long way since then, with the popular Twitter account We Want Plates currently documenting a series of unconventional plate replacements – including shovels, dog bowls and even shoes. To see exactly what the public is willing to eat their food off, YouGov Omnibus showed 2,030 Brits a series of increasingly unconventional eating vessels (drawn from the We Want Plates archive) and asked them to tell us which they consider to be acceptable for restaurants, cafés and pubs to serve meals on or in. Of the objects shown, the public viewed footwear as the least acceptable means of presenting food. Fewer than one in ten Brits (9%) say it is acceptable to serve food in a shoe (it is worth noting the question wording did stipulate that all vessels are clean). A dog bowl is the second-most inappropriate plate replacement. The overwhelming majority of Brits take exception to eating from the same type of dish as Fido and Rex, with just one in ten (10%) saying it was an acceptable thing to eat food from. Three other vessels also failed to gain the support of a majority of Brits: shovels (17%), jars (18%) and flooring panels (28%). One unconventional food receptacle does gain favour with a majority of Brits, however – a plant pot. Just over half (52%) say it would be ok for restaurants, cafés and pubs to serve food in a plant pot (which in the photo used in the research was holding a portion of chips), compared to 45% who consider it unacceptable. Unsurprisingly, the standard circular plate was the least controversial vessel – pretty much everyone (99%) believes they are an acceptable way to serve food. 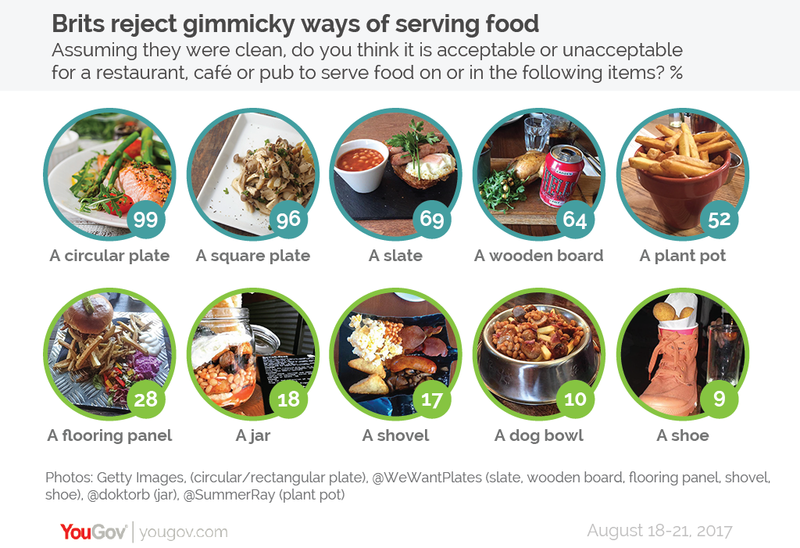 The results also show that William Sitwell seems to have lost the war on square plates, as 96% of Brits consider them an appropriate surface for food. Slates and wooden boards also receive the backing of the majority of Brits (69% and 64% respectively). Both are staples of restaurants and gastropubs attempting to effect a classier atmosphere, and, perhaps as a result, are the only two vessels on which there is a noticeable difference between working and middle class opinion. Those in the ABC1 social grades (middle class) are 12 percentage points more likely to consider slates acceptable than those in the C2DE social grades (working class), and 8 points more likely when it comes to wooden boards. While this selection of unusual culinary conveyances may cause some to raise their eyebrows and roll their eyeballs, we may see more of them in future. The results show that younger Britons are generally more likely than their elder peers to consider it ok to serve food on or in unconventional items.